Wash and soak blackgram four hours. Drain water and grind it to fine paste adding very little water. Add a pinch of salt and the rice flour and mix it well. Leave it covered for a minimum of three hours. Pressure cook bengalgram with just enough water. Add jaggery or sugar to it and cook it again stirring in between till it becomes a thick paste. Add the coconut pieces (fried in a tbsp of melted butter), cardamom powder and the remaining melted butter and mix well. Make them into medium size balls. Heat oil, dip each sweet ball in the blackgram-rice flour mix and fry till golden brown. Three to four ball can be fried at a time. Stored in a air tight container, they last for two to three days. Before eating, make a hole and fill it with two spoons of melted butter, provided your diet permits. Sometimes, while being fried, these poornam boorelu may break if the consistency of the blackgram - rice flour mix is not soaked long enough. You have to be very careful on these two counts. To the remaining blackgram - rice flour mix add salt and green chili paste. Make medium size balls and fry in oil. They make great savory and go well with the sweet. approx 3-4 mts. Remove and cool. 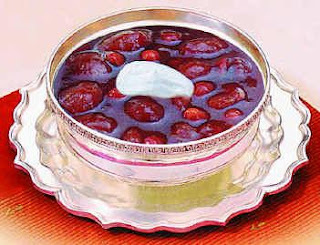 Meanwhile, add just enough hot water to the tamarind such that its immersed and let it soak such that it softens. add the coriander seeds, cumin seeds and red chillis and fry for 2-3 mts. Cool, make a fine powder and keep aside. Once cool, grind the fried ginger slices, softened tamarind, jaggery and salt to a fine paste. Remove onto a dish and add the ground spice pwd.Heat 2 tsps oil in a pan, add the mustards seeds and let them crackle. Add the curry leaves and crushed garlic and fry for a few seconds. Add this to the ginger pickle and combine well. Store the pickle in an airtight container and refrigerate. • Soak the gram dal in enough water for two hours. • Boil the raw bananas in a pressure cooker and peel them. • Smash the boil bananas. • Meanwhile drain the water and grind the dal into a coarse paste. • Make dough by mixing mashed bananas, coarsely grounded dal and all other remaining ingredients. • Make small balls of dough and pat on a plastic sheet into circular shapes. 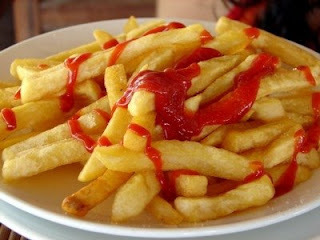 • Heat oil in a frying pan and fry them until brown and serve hot with any sauce. 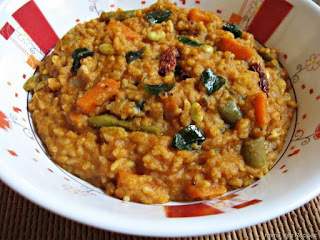 • Wash and soak urad dal, long grain rice and fenugreek seeds separately for at least 6 hours in water. • Now grind them together by adding requisite amount of water to make a fine paste. • Add salt and set the mixture aside for fermentation for a day. • Saute onions, mustard seeds, chana dal and chilli in a pan with oil. • Add chopped potatoes, tumeric and salt and stir continuously. • Cook it for a few minutes. • Pour a ladle of the batter on a non-stick pan and give it a circular shape. • Drop little oil around it and turn over when bubbling appears. 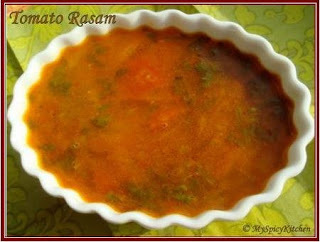 • Fill in the center of dosa with a spoonful of masala and fold it. • Masala dosa is ready. Combine all the above ingredients and store in a clean, dry bottle and refrigerate. Use a clean spoon to remove pickle. This pickle can be eaten within 8 hours of preparation.I had written a few tips on how to make pickles which will help you during the pickling process. Sun dry mustard seeds for a day and grind to a fine powder and store. For methi powder,dry roast methi seeds till it reaches a red color, cool and grind to a fine powder.Red chilli powder used for pickling is preferred. Its available in most super markets or departmental stores.Sesame oil is best, incase you don’t have sesame, you can use any refined oil.Remember to prepare pickles in moisture free area. Grind fresh coriander leaves, grated coconut, green chillis and salt to a fine paste without adding any water.Transfer the ground paste onto a serving dish and combine with beaten curd.Heat oil in a pan, add mustard seeds and let them pop, add the split gram dal,chana dal and let it turn red. Add the curry leaves, red chillis and asafoetida and toss for a few seconds.Turn off heat and pour over the coriander-curd mixture. Combine.Serve with white rice or rotis. • Mix all ingredients except chicken together in a bowl. 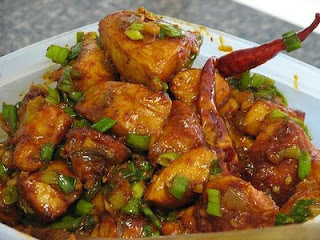 • Add chicken (cut in cubes) and marinate it in the above-mentioned bowl. • Cover and refrigerate at least 4 hours. 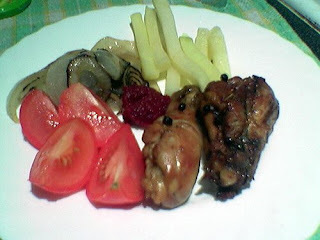 • Bring chicken to room temperature and skewer on bamboo skewers (soaked in water for 30 minutes). • Place on baking tray and bake in oven for 20 to 35 minutes. • Pour oil into a frying pan and heat it. 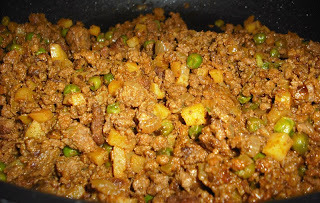 • Add chopped onions and fry on medium heat till they become golden brown. 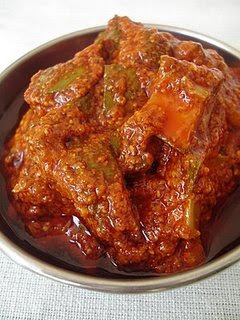 • Add the tomato and capsicum and fry it for few minutes. Now add eggs, salt, red chilli and mix it properly. Cook the mixture until eggs are well done. • Put coriander leaves into the mixture. Take off from the flame and leave the mixture aside. • Make the dough by adding sufficient water to the flour. Knead it to convert into soft dough. Add 2 tbsp of clarified butter to it and knead it again for some time. Make small balls out of the dough. • Roll the balls to give them roti shape. • Take one roti and put the egg mixture. Cover it with another roti. 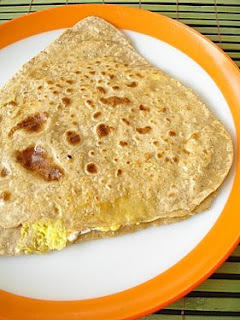 • Roll this roti a little and fry both sides properly in butter. • Egg Paratha is ready to serve. Wash and Boil the potato.Peel the skin and chop into small chunks. Heat about two tbsp of oil. Add mustard seeds and when the seeds start to splutters, add the jeera, green chilli, salt, ginger and garlic. Fry for a few seconds and add onions and turmeric powder. When the onions start to turn brown add potatoes and lemon juice. Mix well and turn off the heat. Let this mixture cool. Shape into small balls. 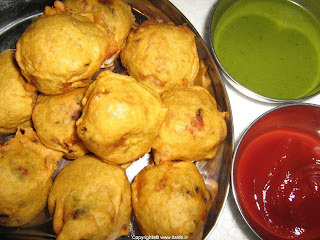 Make a thick batter with Besan, riceflour, salt, red chilli powder, baking soda and water. Heat the oil for 10 to 15 minutes on medium heat. When the oil is hot, Dip the potato balls into the batter and carefully drop in the oil. Turn it every 3-4 minutes fry till golden brown and remove from the oil. * Fenugreek powder - Dry roast fenugreek till golden brown. Powder it in a mixie and then sieve using fine mesh. Cut cauliflower into small flowerettes, wash well. Keep immersed in water to which salt is added for 10 minutes. Drain water completely. Spread it over a towel to remove excess moisture. 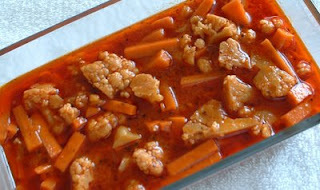 Heat oil in a deep curved pan, add mustard, asafoetida and then cauliflower pieces. Fry for 2 to 3 minutes. Add salt, chillipowder and fry for another one minute. Just before removing from fire add fenugreek powder. Squeeze lemon juice, mix well. Boil moongdal in pressure cooker.To this add the rice flour, butter and all other dry ingredients and mix well.Now add water little by little and make soft dough. Make small balls from this dough and put it into the Murukku maker (commercially available). Press the murukku-maker to lay murukku on a sheet of aluminium foil / plastic. Deep fry in a kadai until golden brown. Now take them out with a slotted spoon and drain them well. Place them on a paper towel for further draining. Keep the Murukku in an air tight container when they are cool. Method: Mix together the chicken, egg, corn flour, garlic and ginger paste, and enough water so that the chicken pieces are 'coated' with the batter. Leave thus about 1/2 an hour. Heat the oil and deep fry the chicken pieces over high heat to begin with and then lower the heat till chicken is cooked through. Drain on absorbent paper till required. Heat 2 tbsp of the oil in a wok, and stir fry the onions in it over high heat till they look 'wet'. Add the green chillies and stir a few times, add the remaindered salt, soya sauce, vinegar, and the chicken. Mix well, and serve garnished with some greens. An old fashioned cabbage slicer can be used (careful of the fingers) - or use a sharp knife or food processor with a thin slicing blade. Fry in hot oil at 390 degrees F. until a light golden brown. Don't try frying too many at once, better to put one layer on the frying basket. Drain on paper towels or any kind of plain crumpled absorbent paper. If you haven't any paper, use a worn dish towel. Salt lightly. These can be kept for some time if they are sealed into plastic bags or containers after they have cooled. Combine carrots with sugar & milk and cook for 30 minutes over low heat, until it becomes thick.Put cardamoms, cashew nuts & ghee and stir constantly, until it becomes thick.Spread the mixture in a greased tray & leave it to cool for 30 minutes.Then cut into squares. * Soak potatoes in ice cold water for 1 hour at room temperature. Drain well; pat dry with paper towels. * Heat oil in deep fryer to about 375°. * Place potato strips in a single layer in deep fry basket; fry in hot oil for about 4 minutes, or until golden brown and tender. * Drain the homemade french fries on paper towels then keep warm in the oven while frying remaining batches. Vulli payalu sannaga podavu mukkalu cut chesukovaali. vankayalu subramgaa kadigi sannaga podavugaa mukkalu cut chesukovaali.vankaya mukkalu eppudu cut chesina ventane nitilo vesukovaali. nitilo koncham salt veste mukkalu nallapadavu. stove mida mukudu pettukuni oil vesukovaali. mundu karivepaaku veyinchi tisukovaali. vulli mukkalu vesi vegina taruvaata allam vellulli vesi veyinchaali. dinilo vankaya mukkalu vesi veyinchukovaali. koncham salt , pasupu kuda vankaya mukkalato vesukovaali. 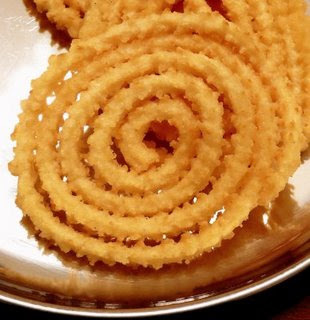 vankaya baga vegaaka pakodini chidimi adi kuda vesi fry cheyyali. lastlo dinchemundu garam masala salt vesi oka 5 mins veyinchi dinchukovaali. veyinchi vunchukunna karivepaaku dinilo kalapali. lastlo salt chusi vesukovaali. ee fryki oil koncham ekkuve padutundi. nalla vankaayala kante green vankaayalu ayite taste baaguntaayi. Cut each bread slice along the diagonal to form two triangular pieces. Keep aside. Grind garlic, green chili, mint leaves, salt and lemon juice into a paste (do not add water). Smear this paste on both sides of the bread pieces. Mix gram flour(besan), red chili powder, yoghurt, egg white, water and salt thoroughly into a batter (be careful -- the batter must not be too sloppy! Its consistency should be such that it can stick to the bread slices). Heat oil in a wide skillet. Test if oil is hot by dropping a pinch of the batter in the oil. If batter sinks, then the oil is not yet hot enough. If it bobs on the surface and bubbles form around it, then the oil is ready. Take each bread piece, dip in the batter so that it is coated thoroughly on both sides and drop in oil. Deep fry until golden brown on both sides. 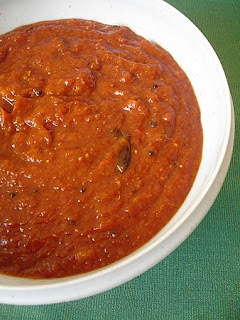 Serve hot along with either ketchup or mint chutney. క్యారేట్ని శుభ్రం చేసి చిన్న ముక్కలుగా తరగాలి. తరువాత తగినన్ని నీళ్లు పోసి ఉడికించాలి,తరువాత మిక్సీలో వేసి ముద్దగా చేసుకోవాలి. ఇప్పుడు పాలని బాగా మరగనివ్వాలి,మరిగిన తరువాత క్యారెట్ ముద్దని వెయ్యాలి. తరువాత పంచదార వేసి బాగా కలపాలి. యాలకుల పొడి కూడా వెయ్యాలి. 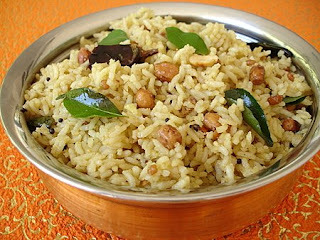 Mix the cooked rice with 2 tbsp oil,salt, turmeric pwd,roasted peanuts and 10 curry leaves. Keep aside. Heat 2 tbsp oil in a vessel.Add the mustard seeds and let them splutter.Now add dry red chillis,cumin seeds,channa dal,urad dal and fry for 15-20 seconds till light brown. Now add the slit green chillis,ginger,asafoetida and curry leaves and fry for 10 seconds.Now add the tamarind extract and cook till the raw smell disappears..approx 3-4 minutes.Add the seasame seeds powder and mix well.Remove from heat. Add this to the rice and mix well.Adjust salt. Note:You can adjust the tamarind extract according to your taste. In a heavy based pan, place the milk over low heat. Stir occasionally for 1 hour until the milk reduces its original volume by 1/6th. Roast the pistachio nuts and cut them. Mix the water & sugar. Heat them to make a thick syrup. Cover and keep aside. Now, put the sugar syrup, roasted pistas, rose-water and green coloring to the reduced milk. Stir until the mixture holds together without sticking to the pan. Spread the mixture in a greased tray. Allow it to stand for about 45 minutes to set, then cut into squares. Wash fish steaks and drain water. Make a paste of chilly powder, turmeric powder, ground ginger and garlic, coriander powder, lemon juice and salt. Rub well the paste on each steak and marinate for one hour. Heat the oil in a large wok for deep frying. Fry each steak for about one minute on each side or until the colour changes to light brown, on a high flame. Set all the steaks on a baking pan. Heat the oven for 400 degrees and bake it for 15 minutes or until tender. Garnish with onion slices and coriander leaves. Clean mutton or lamb and cut into one and half inch sized pieces. Pick, clean and wash rice. Soak rice in water. Chop green chillies. Peel ginger and cut into julienne (thin strips). Wash coriander and mint leaves and roughly chop them separately. 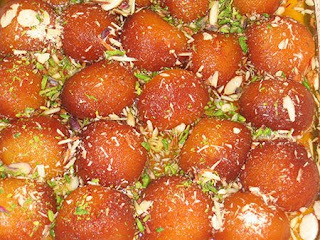 Soak saffron in warm milk and keep aside. Marinade meat pieces with yogurt, salt, turmeric powder and one tablespoon each of ginger and garlic pastes for 4 hours. Cook rice in salted boiling water along with whole garam masala till rice is almost cooked. Strain and keep the rice warm. Heat ghee or oil in a thick-bottomed pan or pressure cooker. Add sliced onion and chopped green chillies. Cook till onion is light golden brown. Make sure to stir continuously. Add remaining ginger and garlic pastes and mix well. Add marinated meat and cook on high flame for seven to eight minutes. Now, add coriander powder, cumin powder and red chilli powder. Mix thoroughly. Stir in three cups of water, bring it to a boil, reduce heat and cook covered till meat pieces are almost cooked. 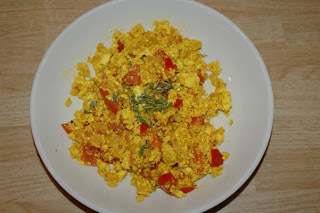 Add chopped tomatoes, salt, one teaspoon garam masala powder and chopped fresh coriander leaves. Cook for fifteen minutes on medium heat, stirring occasionally. In case you are cooking meat in the pressure cooker, add chopped tomatoes, salt, garam masala powder, two cups of water and chopped fresh coriander leaves after adding dry spices. Pressure cook till meat pieces are almost cooked. It normally takes two or three whistles to cook the meat. Ensure that the cooked meat does not have too runny a gravy. If that is the case, cook on high flame to reduce water content. 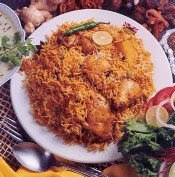 Arrange half the quantity of cooked meat in an oven proof dish and spread half the quantity of cooked rice on top of the meat. Sprinkle a little garam masala powder, half amount each of ginger julienne, saffron dissolved in warm milk and mint leaves. Dot the rice with half the quantity of butter. Place a layer of remaining meat on top of the rice, followed by cooked rice and repeat the earlier process with the remaining quantities of ginger julienne, saffron milk, garm masala powder, mint leaves and butter. Cover it with aluminium foil and cook in a pre-heated oven for fifteen to twenty minutes. 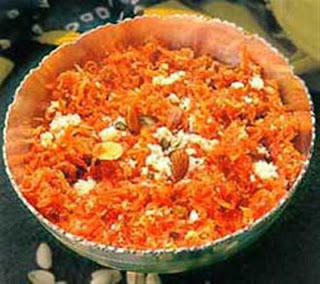 Serve garnished with fried sliced onions and mixed vegetable raita. Make a paste of grated coconut, garlic cloves and cumin seeds. Slit green chillies into two. Chop the coriander leaves. Wash, chop tomatoes roughly and add salt and red chilli powder. Transfer it to a pan and add three cups of water and bring it to a boil. Simmer for fifteen minutes and puree when it is a little cool. Heat ghee in a pan and add mustard seeds, asafoetida and curry leaves. And pureed tomatoes and slit green chillies and bring it to a boil and add sugar. Add coconut and spice paste. Cook on a low heat for ten minutes. Correct seasoning. 1. Heat the oil and splutter the mustard seeds. 2. Fry the urad dal and curry leaves. 6. Add the hot water and salt. Cook on low heat. 7. When dry, add the coconut(not necessary) mix and serve. 4.Once done add the chopped coriander leaves and mix well. Chop the onions fine and add it to the mince together with cabbage, chopped carrots, celery stalks and leaves, grated ginger, garlic, haldi powder, and a few green chilies.Mix thoroughly and cook, uncovered, in a preheated oven on gas mark 4 for 45 minutes. Remove from the oven.Garnish with chopped coriander leaves and serve hot with relishes. Combine sugar & water. Heat until it becomes a thick sugar syrup. Take the brown corners of the bread and make it into smooth dough with enough water. Heat oil in a deep curved pan & fry few bread balls at a time in medium flame till it becomes crispy & brown. Then put this fried ones in the sugar syrup. Boil Rice the usual way. Drain and set aside. Make a paste of green chilis, coriandar leaves and ginger. Add two tablespoons of oil in a pre-heated pan. Add the green paste and saute it for a minute. Add a pinch of salt to the paste while you saute it. Add the cleaned white prawns to it. Keep stirring till the prawns change color and start turning into balls. Now add the cooked rice into it and mix carefully. 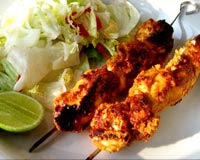 Marinate turkey with yoghurt, chillipowder, corainder powder, garam masala powder and salt. Set aside for atleast 4 hours. Add 3 tablespoons of oil to the frying pan.Add ginger garlic paste when oil is hot and fry till golden brown. Now add cut onions, green chillies and fry till onion is transparent.Add tomatos and fry well. 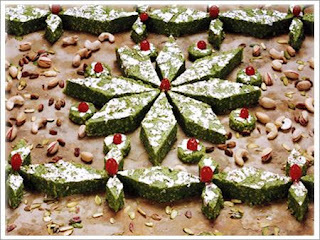 Add mint and corainder leaves and set aside to cool. Once cooled, blend all this in a blender till the mixture becomes finely grinded. Add ghee and oil to a frying pan, when heated add cloves, cardamon and cinnamon.Fry till brown. Now add salt, the blended and the marinated mixtures and mix well. You can also add mint and corainder leaves while cooking. If you are using pressure cooker let the mixture with turkey cook for 2 whistles.Otherwise for frying pan cook the mixture for 30-40 minutes, till the meat is half cooked. Let the rice cook.Once done serve hot with curd raita. Clean and wash chicken and set aside. In a pan heat oil, add cumin seeds. After a few seconds add ginger garlic paste and saute for 5 mins. Then to it add chicken and salt and cook on low flame till the chicken tenderizes. Add 1/4 cup water if reqd. When chicken is done sprinkle black pepper powder and mix well. Lastly beat 2 eggs and add to chicken and stir till the egg in it cooks well. Finger licking, lip Smacking Chicken is Ready!!!! •Soak the wheat overnight, drain and pound. •Heat 6-8 cups of water in a heavy-bottomed vessel. •Add dal, wheat and mutton along with ginger-garlic paste, haldi, dhania powder, red chili powder and salt when the water begins to boil. •Cook on low flame till the mutton turns tender. •Add sliced and fried onion. •Heat ghee and pour it over the Haleem. 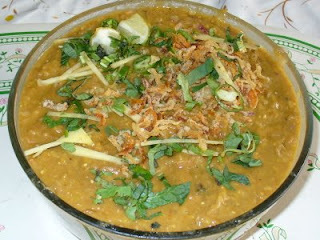 •Haleem is ready. Sprinkle with lemon juice. 1. Cut paneer into small cubes. 2. 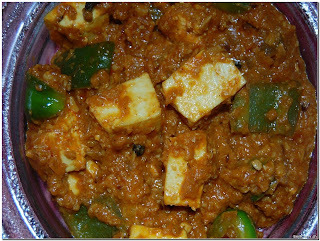 Boil 2 cups of water and add 1 teaspoon of salt in it, when water is about to boil, add paneer cubes and put the flame off. 3. Drain off the water and keep paneer aside. 4. Heat oil in a kadai, add dry red chilly and bay leaf, and then add chopped onions and saute till golden in colour. 5. Add ginger-garlic paste and fry for 3 minutes on medium flame. 6. Add red chili powder, crushed coriander seeds, turmeric pd, cumin pd, tomato puree and stir-fry for 1 minute. 7. Now add capsicum, and continue frying it on medium heat till masala starts leaving oil. 8. Add kasuri methi, garam masala powder and 1/2 cup of water into it. 9. Add paneer and salt. Cook for 3-4 minutes on low flame. 10. Serve hot with Nan or Paratha. Wash the rice and dry it. Boil carrot, potato, green Peas. 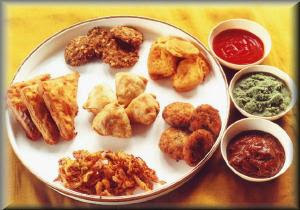 Make half of the masala items into paste. Place a big vessel on a low flame. Pour oil, ghee in the vessel. Add the remainig masala items to the oil. Add the onions, greenchillies, Masala paste, Biryani leave and let it fry. Pour water twice that of rice. When boiling, add rice to it. Add salt, boiled carrot, potatoe green peas. Boil for some time. Add Ghee fried cashew nuts. 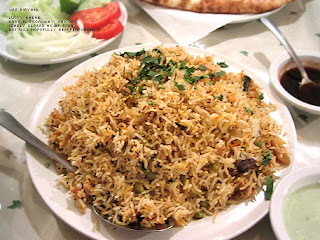 Now hot vegetable pulao is redy to eat. 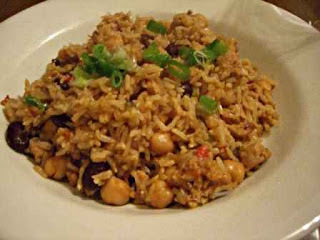 add chopped almonds and simmer on low heat for fifteen to twenty minutes. 2 Add green cardamom powder and nutmeg powder and continue to boil for another two minutes. Eperate the gongura leaves from the stalks and leave them in an open cool and dry place for 2 days so that the leaves wither.After 2 days wash the leaves.Spread over kitchen towel. Heat 2-3 tbsp oil in a thick bottomed vessel.Add the leaves and fry them till rawness disappears and it becomes soft.Remove and cool.The fried leaves should look like shown in the picture. In the same vessel add 1 tbsp oil and add methi seeds and fry till light brown and then add coriander seeds,urad dal(black gram),channa dal (bengal gram lentil) and dry red chillis and fry stirring constantly till light brown.Add the slit green chillis and fry for 2 minutes.Remove from fire and cool. Grind these above ingredients with salt.Now add crushed garlic and the fried gongura leaves and grind very coarsely.It should not be soft. Now heat 3 tbsps of oil in a pan and add the mustard seeds and let them splutter.Now add the whole dry chillis and curry leaves and fry for 20 seconds.Remove from fire and add to the ground gongura pachadi along with the oil.This pachadi does require a wee bit more oil like most pickles. This particular pickle can be stored in the refrigerator upto 3-4 weeks and goes well with hot steamed rice and a liberal dose of ghee and sliced raw onions. Note: Use the red stemmed variety of leaves which is more sour than the white stemmed.If you are using the leaves of the white stemmed variety,you can add approx 1-2 tbsp tamarind extract while grinding the ingredients.